Today Leesburg, county seat of Loudoun County, is home to many D.C. commuters and the Leesburg Executive Airport. However, European settlement of Leesburg began as early as the 1730s when tidewater planters began establishing large farms and plantations in the area. The actual town was established in 1758 when the British Colonial Council decided to establish the county courthouse there. The town was named to honor Thomas Lee, a leading colonial political figure and great-granduncle to Robert E. Lee, and was 60 acres. Today the town is 12.5 square miles large and was home to 47,673 residents as of the 2013 census. Leesburg served as a haven for the U.S Government and archives temporarily during the War of 1812—protecting the Constitution, Declaration of Independence, and portraits of early American leaders from the British. During the Civil War the Confederate victory at the Battle of Ball’s Bluff took place in Leesburg, the site it now marked by one of America’s smallest national cemeteries. Leesburg’s historic district joined the National Register of Historic Places in 1970 and has been cited as one of the best preserved and most picturesque downtowns in Virginia. Historic sites to visit in town include: The Marshall House, Morven Park, Oatlands Plantation, White’s Ferry, and Exeter Plantation. You can also bike along the Washington & Old Dominion Trail, take a picnic to Ida Lee Park, visit businesses and antique shops downtown (especially on the first friday of every month! ), or visit the Loudoun Museum. The first major battle of the Civil War, the First Battle of Bull Run, was fought in Manassas in July 1861. The Second Battle of Bull Run was also fought nearby. At the time the town was little more than a railroad junction, but a significant one right in the middle of Richmond, Washington D.C., and the Shenandoah Valley. After the war Manassas Junction grew into a town in it’s own right, and today has a population of about 41,705 residents. The town is in Prince William County, though is an independently incorporated city, and is home to the Manassas Regional Airport. The Manassas Historic District, Cannon Branch Fort, the Manassas Industrial School for Colored Youth, and the Liberia plantation house are all listed on the National Register of Historic Places. There are a variety of parks to visit in Manassas, as well as Bed & Breakfasts to stay at and breweries to visit. Visit the Center for the Arts at the Hopkins Candy Factory, a factory built in 1900 and renovated in 2001 to a multipurpose art gallery, theatre, and studio classroom space. Tuesdays around dinnertime and Wednesdays around lunchtime enjoy concerts at the Harris Pavilion, on Thursdays and Saturdays peruse the Farmer’s Market, several Fridays a month bring your kids to “Family Movie Night” at the Harris Pavilion, or join a historic downtown walking tour presented by the Manassas Museum on Saturdays. In 1749 the Virginia House of Burgess approved the waterfront location for the establishment of Alexandria and a young George Washington was the one to actually bring the news to the townspeople and survey the land. Alexandria was raided by the British during the War of 1812, was home to one of the largest slave trading companies in the U.S. (the slave pen later became a jail when under Union control), and was ceded to Washington D.C. when the capital expanded—then ceded back to Virginia when the capital was downsized. Alexandria was a hotbed of activity during the Civil War, with many forts constructed in an effort to protect D.C.. Being under Union occupation, many African American slaves poured into the city in a bid for comparative freedom and opportunity. By 1863 the population of the city had increased by 10,000 people in 16 months, and once the Fifteenth Amendment was ratified the city had the constituency necessary to elect the first black Alexandrians to the city council and state legislature. Historic landmarks in the city include: Gadsby’s Tavern, Christ Church, the John Carlyle House, the Little Theatre of Alexandria, the Lloyd House, the Lee-Fendall House, Jones Point Light, Market Square, and Robert E. Lee’s boyhood home. While there you can shop around at boutiques and eateries in the historic downtown area, visit the Torpedo Factory Art Center, or take a trip just nine miles south to Mount Vernon. Museums to visit include the Alexandria Archaeology Museum, the Alexandria Black History Museum, the Fort Ward Museum and Historic Site, the Friendship Firehouse Museum, the Stabler-Leadbeater Apothecary Museum, and the Alexandria Lyceum History Museum. As settlers began to move inward from the Virginia coastal region Fredericksburg, along the banks of the Rappahannock River, became an ideal location for a settlement. The Virginia General Assembly established a fort in 1676 along the river just below the location of the present-day city. George Washington’s family moved to Ferry Farm in Stafford County in 1738, just across the river from Fredericksburg. Today the grounds house a visitor’s center, museum, gardens, and the original site of Washington’s boyhood home. The house in Fredericksburg city itself where Mary Ball Washington moved later in life is also open to tour, as well as his sister Betty’s estate, Kenmore Plantation. Other significant residents of the city included Revolutionary War generals Hugh Mercer and George Weedon, naval war hero John Paul Jones, and future president James Monroe. Due to its location directly between Washington D.C. and Richmond, Union and Confederate capitals, Fredericksburg sustained significant damage during the Civil War. Today you can visit the sites of the First and Second Battles of Fredericksburg, the Fredericksburg and Spotsylvania National Military Park, the Confederate Cemetery right near downtown, or walk the Fredericksburg National Cemetery—where over 15,000 Union soldiers were buried. The Fredericksburg Historic District covers 40 blocks, and over 350 buildings dating to the 18th and 19th centuries. You can grab a float at Goolrick’s Pharmacy—the oldest continuously operated soda fountain/working pharmacy in the U.S., visit Carl’s Ice Cream—the iconic roadside soft-serve station listed on the National Register of Historic Places, or traverse the picturesque University of Mary Washington campus. Other historic homes and museums to tour include: the Rising Sun Tavern, the Hugh Mercer Apothecary Shop, the 1852 courthouse designed by James Renwick, the Railway Museum, or the James Monroe Museum and Memorial Library. The settlement of Winchester began as early at 1729 when a group of Quakers from Pennsylvania purchased plots of land from the native Americans in the region and built a settlement. In the mid-1700s Winchester was an important frontier city; the Governor of Virginia, young military commander George Washington, and their Iroquois allies would meet there to coordinate their actions during the French and Indian War. Many Civil War battles took place in and around Winchester, as both the Confederate and Union armies fought for control of the Shenandoah Valley. Clashes within the city included the First/Second Battles of Kernstown in 1862/1864, and the First/Second/Third Battles of Winchester in 1862/63/64, as well as many small skirmishes, raids, and reconnaissance missions. Historians have claimed that Winchester may have changed hands up to 72 times over the course of the war, and as many as 13 times in one day! Civil War enthusiasts can visit many forts in the area—Fort Jackson, Fort Alabama, Fort Collier, Louisiana Heights, and Bower’s Hill—or cruise down Jubal Early Drive, which was the central location for many of the city’s battles. Just some sites listed on the National Register of Historic Places are the Abram’s Delight home, Patsy Cline House, Douglas School, Fort Loudoun Site, Handley Library, the Hexagon House, Winchester National Cemetery, Old Stone Church, and Mount Hebron Cemetery and Gatehouse. 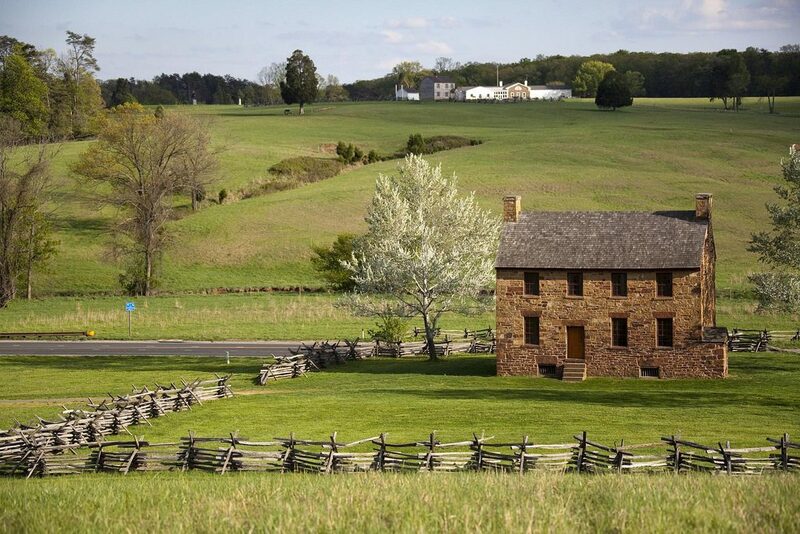 Museums to visit include the George Washington’s Office Museum, the Shenandoah Valley Civil War Museum, Museum of the Shenandoah Valley, Stonewall Jackson’s Headquarters Museum, and the Shenandoah Valley Discovery Museum. When you’re done stopping in to historic sites you can take in a concert at the Bright Box Theatre or Valley Cat Studios, watch a free public movie showing hosted by Magic Lantern Theatre, stroll through local businesses along the Walking Mall while kids play in the splash pad, and mark your calendar for the huge Shenandoah Apple Blossom Festival each year in May. Middleburg was established as a village in 1787 by Leven Powell, a Virginia statesman and Revolutionary War Lieutenant Colonel. The town is located exactly midway between two other towns on this list, Alexandria and Winchester, which made it an important stop on the Ashby Gap trading route (now U.S Route 50). In 1863 Middleburg witnessed two Civil War skirmishes but the small town didn’t see any major battles or damage. Middleburg’s claim to fame comes because of its history of foxhunting and steeplechasing, which started in the early 1900s. The town soon gained a reputation as “The Nation’s Horse and Hunt Capital”, and to this day hosts the Middleburg Spring Races, Middleburg Classic Horse Show, and the Middleburg Hunt and Hounds Review as part of their Christmas in Middleburg parade. John and Jackie Kennedy bought a property in Middleburg called Glen Ora in 1961. They enjoyed horse riding and fox hunting there until selling the home in 1964—although Jackie loved coming back to visit and often stayed at The Red Fox Inn. The inn was founded in 1728 and is still operating today, being billed as the nation’s oldest continually operating inn. Visit Middleburg to see the National Sporting Library, the Benton home, the Burrland Farm Historic District, several other historic homes, and the critically-acclaimed Middleburg Film Festival. Pamper yourself at the luxurious Salamander Spa and Resort, stroll the quaint businesses lined along the cobblestoned historic downtown, go ziplining at Empower Adventures, or sample local wines at nearby vineyards.